Now I know I’ve been relatively quiet for the past few weeks. But it’s the weird transition in the house between taking down Halloween decorations, leaving up Thanksgiving decorations, and putting up Christmas decorations. 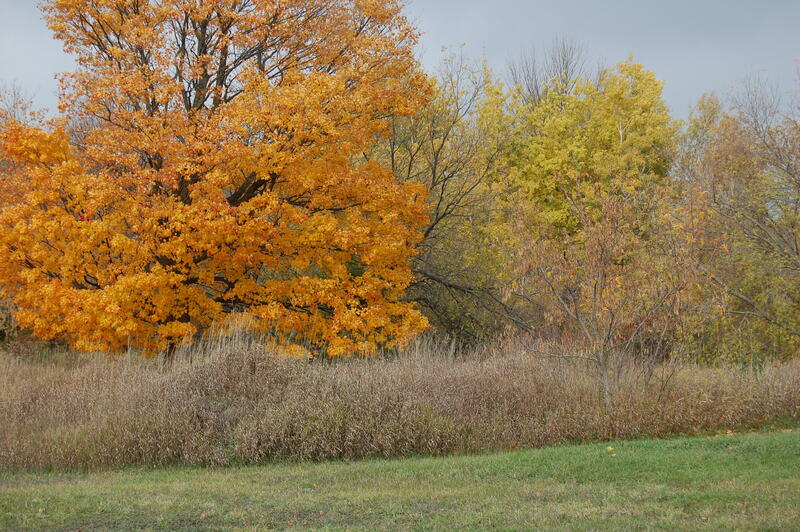 Plus I’m in vacation recovery mode (I went to the Traverse City [TC] area and the Upper Peninsula of Michigan). I promise not to bore y’all with all my vacation escapades. I will just share some of the food-related finds. If you don’t know where Traverse City, MI is, I will show you on your handy Michigan map. Just take your right hand and look at it palm-side-up; looks like the lower peninsula of Michigan, right? Traverse City is just to the right of the tip of your pinky. Don’t believe me, just check out this map. Traverse City is actually a great foodie town. Chef Mario Batali spends his summers just north of the city; Chef Jacques Torres opened up his first chocolate shop outside New York and Las Vegas in Traverse City (it has since closed); it is home to the National Cherry Festival; and prime Michigan wine country is just a stone’s throw away. Speaking of cherries, have you heard of the Great American Cherry Pie War? Well, I don’t know if it’s called that, but that’s the moniker I’m using. 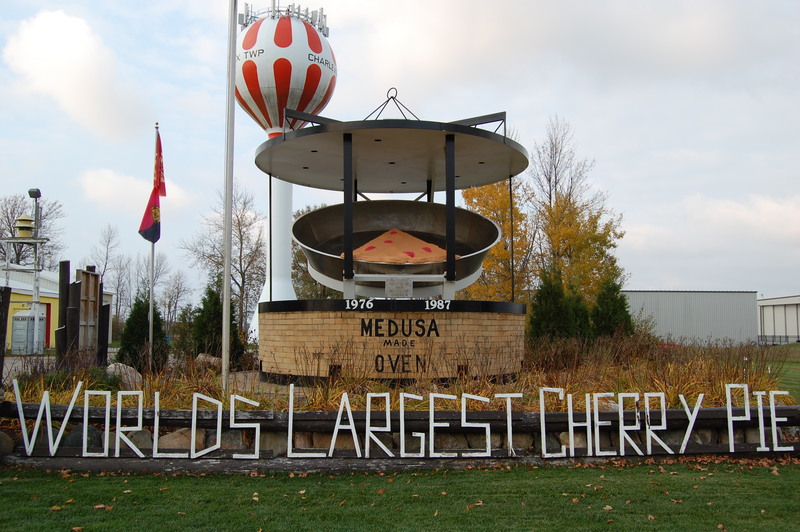 TC and rival town just up the road Charlevoix, MI engaged in a heated battle vying for World’s Largest Cherry Pie. Charlevoix fired the first volley by baking a pie that was over 14 feet across and 2 feet deep. It weighed over 17,000 lbs and was baked in 1976 to help celebrate the US bicentennial. It held the title until TC took the title away with a pie that was over 17 feet across and over 28,000 lbs. Some town in Canada broke the record several years later, but you can visit the pie pans for the Michigan record breakers. They make them big in Charlevoix, MI! They make them even bigger in Traverse City! TC's pie did not appear to be as manicured and celebrated as the one in Charlevoix, as evidenced by the disrepair. 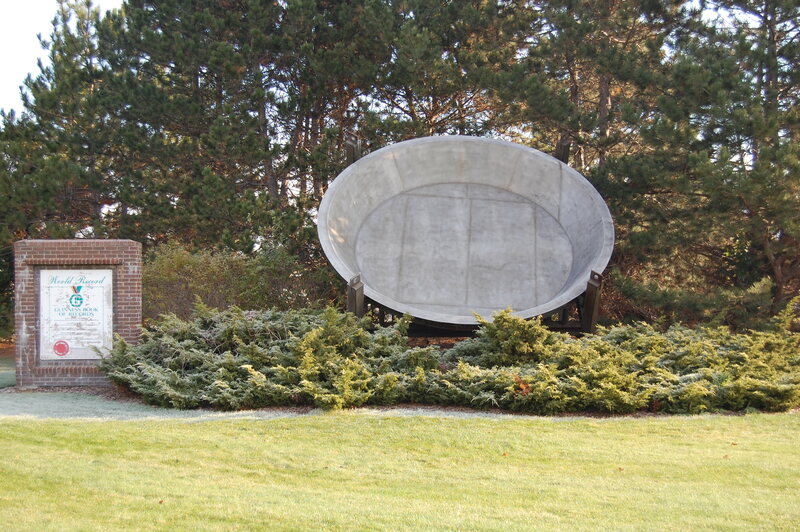 I had actually come across this by accident when I noticed a giant pie pan on the side of the road while taking the scenic route up to St. Ignace, which is just over the Mackinaw Bridge in the Upper Peninsula. That triggered a memory of the duel between the two rival towns that I had read on the Roadside America website. You can read about quirky tourist attractions all over the country. Just type in a city and find out what’s nearby. This website also brought up another interesting TC landmark. 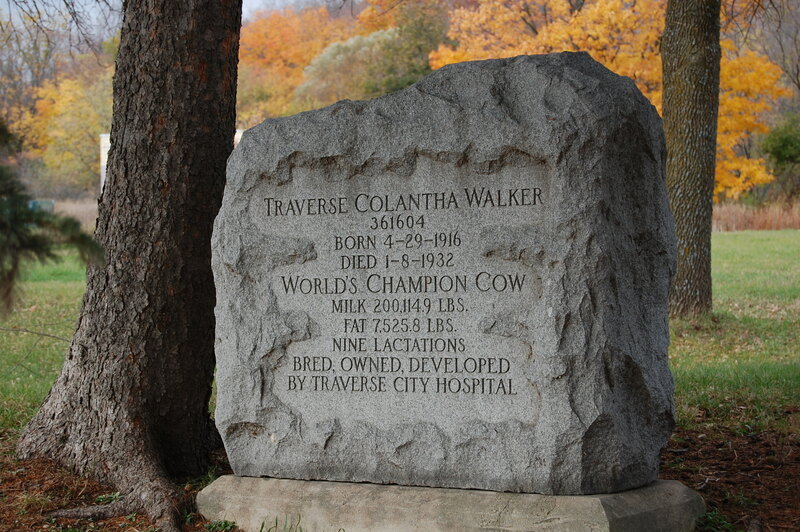 TC is home to a memorial to Colantha Walker, “The World Champion Cow of the Insane”. She was born in April 1916 and was under the care of staff and patients of the Northern Michigan Asylum. 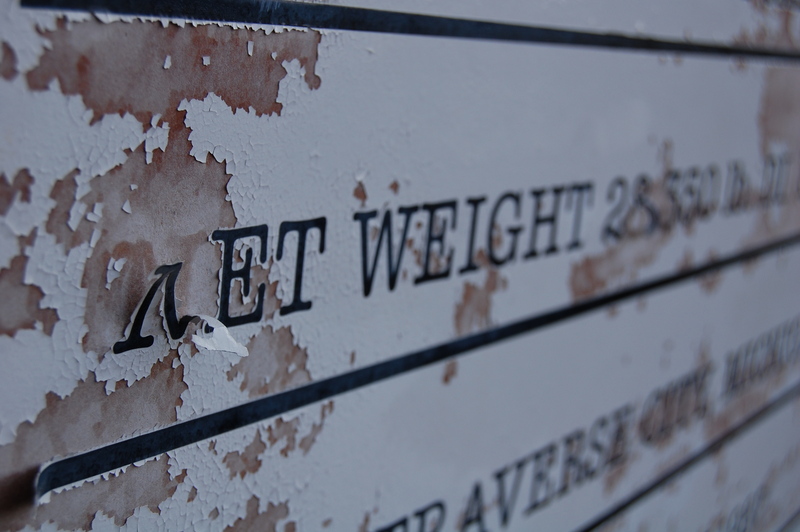 While living on the farm on the Asylum grounds, she produced 200,114.9 lbs. of milk and 7,525.8 lbs. of butterfat. Now I have no clue as to how this compares to non-world champion cows, but it was sufficient enough for her to be immortalized with a rather sizeable granite tombstone after her death in January 1932. But after doing a little research, her landmark year was 1926 when she produced almost 23,000 lbs. of milk, which earned her “World Champion” title. According to census records, the Michigan average for dairy cows was just over 3,900 lbs. a year. Exciting stuff! Like I said, I promise to try not to tire you with yarns about my trip. I’ll post on some great budget-friendly restaurants, a couple local breweries, a bake shoppe that makes the best pumpkin donuts that I’ve ever had, and throw in some smoked fish and pasties (the pastry, not the adornments worn to cover up your unmentionables). I’ll even work in a recipe or two. Stay tuned! The things I learn on a Monday morning. Looking forward to hearing more about the trip, especially the breweries. Cheers! i only had a chance to visit 2 breweries in the area — north peak brewing and shorts brewing companies. both are excellent and i especially love shorts. I love learning about quirky, cool places. Looks like a great place to visit. Anywhere with giant pies goes on my must-see list!